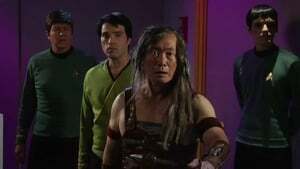 Pilot Episode After receiving a distress call, the USS Enterprise, commanded by Captain James T. Kirk (James Cawley), is assigned to investigate an intruder attacking the Primus IV colony. Once there, the crew encounters a strange alien life form that can produce visions of personal events displaced in time. These visions may hold the key to better understanding the threat they are about to encounter. In an adventure that spans centuries, Captain Kirk fights alongside a U.S.S. Enterprise from the past to stop the devastating "Doomsday Wars" that should never have happened. In a universe forever changed by those events, the crew of the Enterprise must once again battle the powerful juggernaut known as the "Doomsday Machine." Guest starring Original Series alumni Barbara Luna, Malachi Throne. and William Windom as Commodore Matthew Decker. Lieutenant Ilia is mysteriously impregnated and, within days, gives birth to a baby girl, Irska, who appears to be fully Deltan. A curious alien lifeform wishes to study the crew but her presence threatens the ship. "Kitumba" depicts the Enterprise on a suicide mission to the heart of the Klingon Empire. Pulled in every direction by warlords and people that have their own agenda, the Kitumba suddenly finds himself confronting his very enemy: Captain James Kirk and the Enterprise. The choices he makes will resonate through the galaxy for years to come. Captain James T. Kirk's first encounter with the charismatic scientist Doctor Carol Marcus, who is specialised in Terraforming. Carol is the woman who one day will mother Kirk`s son David and also break his heart. Doctor Marcus is leading a terraforming project on Planet Lappa III that goes horribly wrong and devastates the planet. Was it her fault? Or is a mysterious black market operation beind the catastrophy? Kirk and the crew of the refitted, USS Enterprise, investigate. A follow-up to TOS season 2 episode "Bread and Circuses". An episode that goes back to the beginning and explores James T. Kirk's life as a cadet and shows how his adventures all began.